Only one municipality, the City of Johannesburg, has achieved a clean audit – ‘financially unqualified with no comments / findings’ – over the last five years. Johannesburg has since regressed two steps on the ranking to a ‘qualified audit’. "The audit outcomes show a year-on-year stagnation, with 95% (2011: 95%) of auditees receiving either qualified audit opinions with other matters or financially unqualified audit opinions with other matters. In total, 79% of the auditees fall into the latter category. Consistent with the prior year, two (5%) municipal entities received the desired audit outcome of unqualified with no findings, also known as a clean audit opinion. It is concerning that over a number of years no municipality has received a clean audit opinion. It is clear that achieving the 2014 clean administration target remains a challenge for the province." Auditor General Of South Africa, General Report on the Audit Outcomes of Local Government Gauteng, 2011/12. Poor oversight by governance structures such as internal audit units and committees. Concerns such as these are common across Gauteng municipalities. The challenges of achieving a clean audit are significant, especially in a context where fast and often irregular processes of property development make it difficult to bring all owners onto the billing system – raising the matter of 'incompleteness of revenue' – or where there are a large number of municipal entities, some recently established. A municipality also cannot achieve a clean audit if it has pending court cases against it, where the financial implications are yet to be determined, and so no provision can be made. But that said there is a lot that could be done to improve reporting, monitoring and effective oversight. These challenges arise either internally as weaknesses in the current administrative architectures and operations become more apparent, or from external pressures as the demand for effective and innovative urban governance in a fast-changing and complex region grows and shifts. It is not possible to review all of these challenges here, but a sample gives a good indication of the breadth and depth. 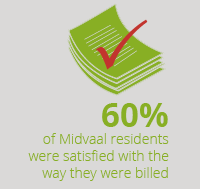 In the 2011 QoL Survey we asked respondents how satisfied they were with the way they were billed for municipal services (i.e. not the cost of the bill). 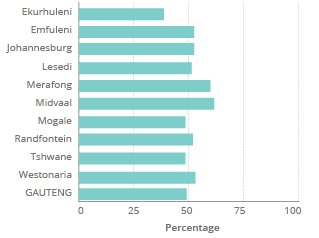 Interestingly, in spite of the media attention given to Johannesburg’s billing crisis, Johannesburg residents were not the most dissatisfied with their bills.